Chicago is a great place to live in the summer. There are endless things to do around the city such as going to the beach along Lake Michigan, watching a baseball game at Wrigley Field or U.S. Cellular, hitting up one of the many weekend street festivals, riding the ferris wheel at Navy Pier, and one of my favorites, visiting the neighborhood farmers’ markets. 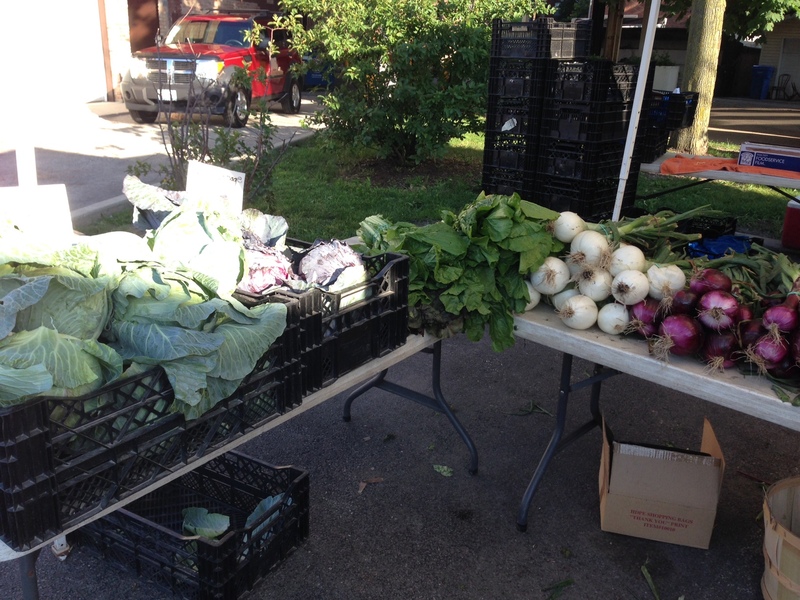 This farm’s fresh veggies were amazing — look at the size of those cabbages on left! Everything looked great…and so did the prices. What treats did I find last week? First I stopped for a jar of the best jarred pasta sauce I’ve ever tasted (from River Valley Kitchens in WI). I don’t doctor this sauce at all. It’s chunky, spicy, and full of mushrooms — just the way I like it! Next I stopped for some fresh peaches. I couldn’t resist! 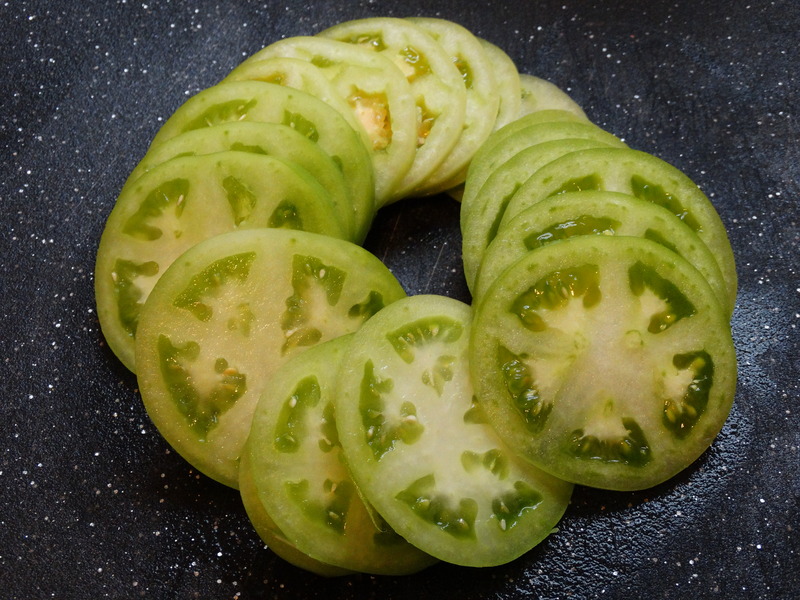 Last, but not least, I picked up three gorgeous green tomatoes. Tote bag heavy with my delicious finds, my friend Caitlin and I headed to the rooftop beer garden at Gene’s Sausage Shop for a drink before heading home. 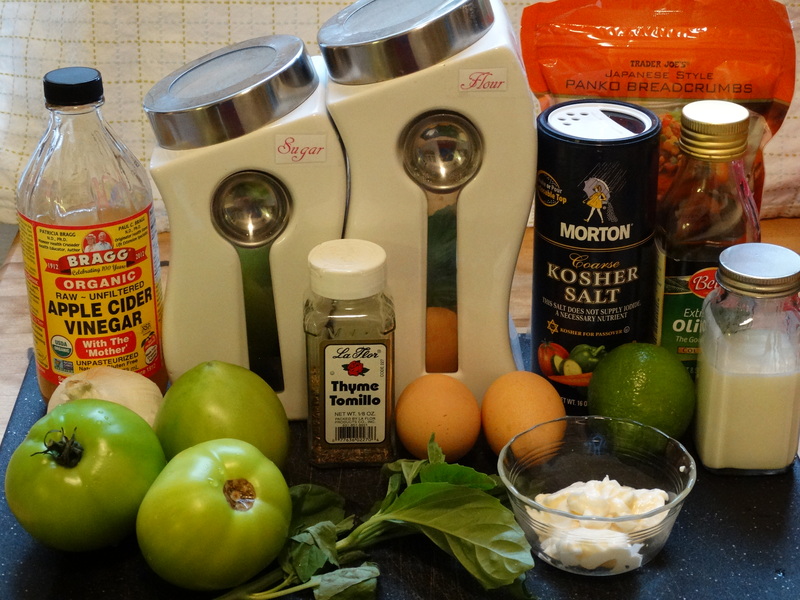 Why fried green tomatoes? I’m not sure. 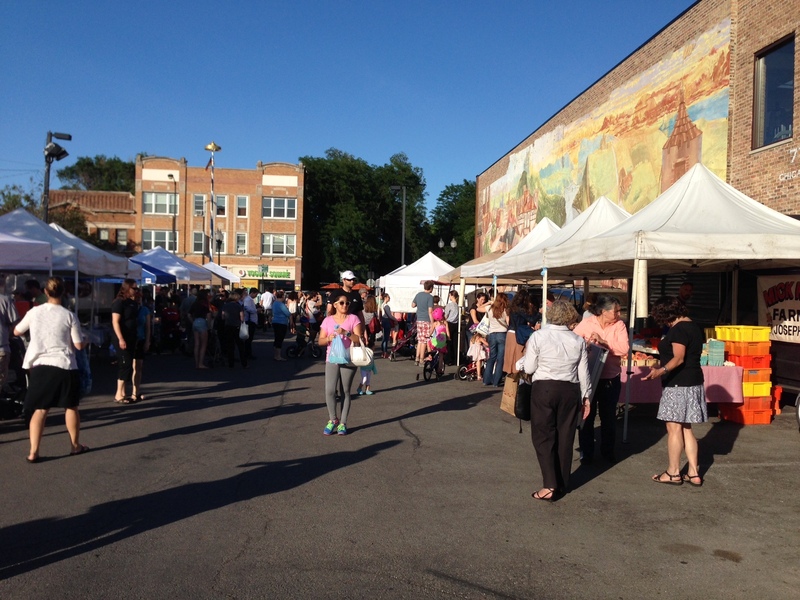 I’ve always wanted to try them…and then there they were in front of my at the farmers market! It was time. The first thing I did was wash and slice my tomatoes. 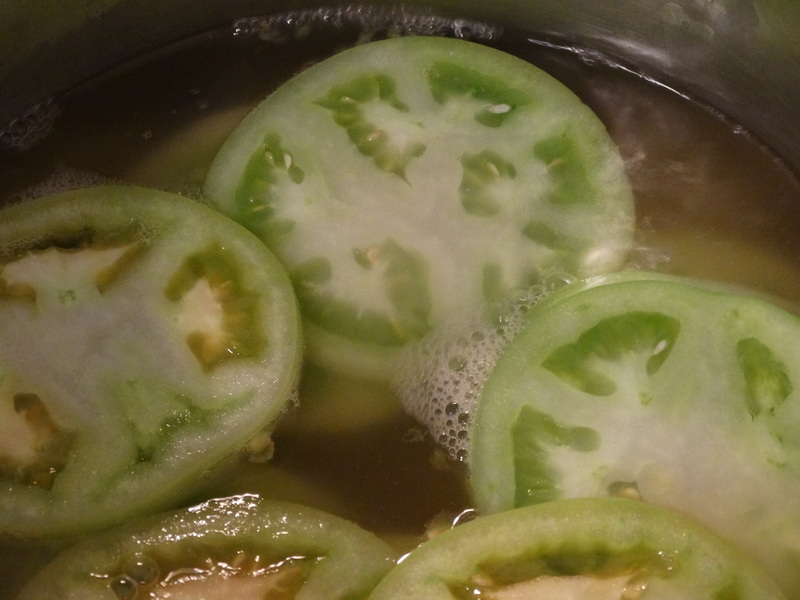 Ever wonder what a raw green tomato taste like? Let’s just say my reaction was to immediately spit it into the garbage can! I have to admit, at this point I wondered how these disgusting things could possibly be transformed into something delicious, but I pressed on, following a recipe from Cooking Light that I have adapted here. My three medium sized tomatoes yielded the perfect number of slices (about 18), each about 1/4″ thick. Bring 1 cup cider vinegar, 1 cup water, and 1/2 teaspoon kosher salt to boil in a medium sauce pan, then add the tomatoes and cook for 2 minutes. Turn the heat off and let them sit for 15 minutes. While the tomatoes are cooling, prepare the dipping sauce. 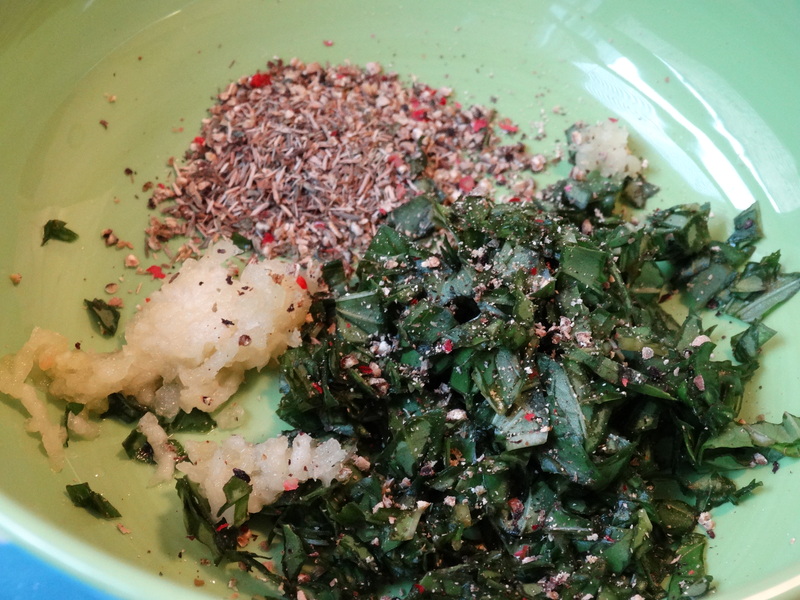 Finely chop 2 tablespoons fresh basil. Mince or press 1 garlic clove. 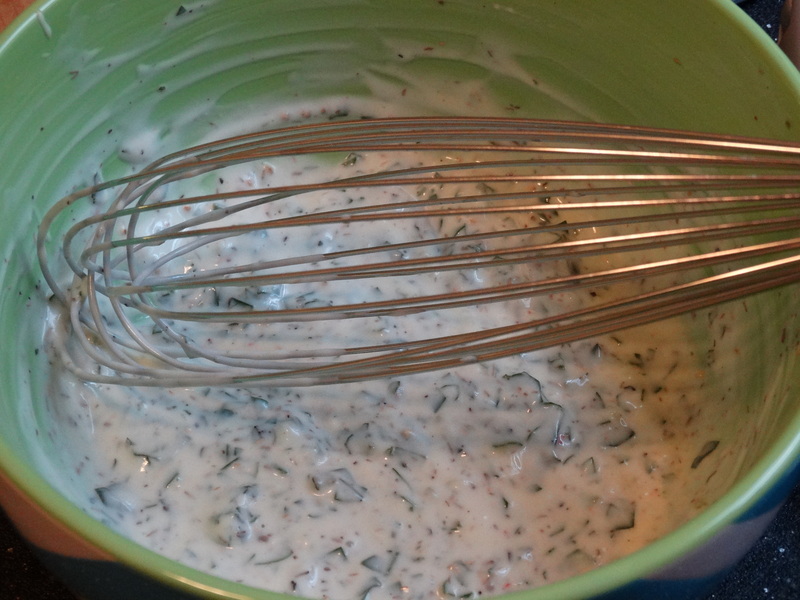 Add these, along with 5 tablespoons buttermilk, 3 tablespoons canola mayonnaise (or any other variety of mayo you have on hand), 1/2 teaspoon dried thyme, 1/4 teaspoon freshly ground black pepper, and 2 teaspoons cider vinegar, into a mixing bowl and whisk until well combined. Drain the tomatoes and pat them dry. I laid mine out on some paper towel. Be patient and wait for your pan to be screaming hot. 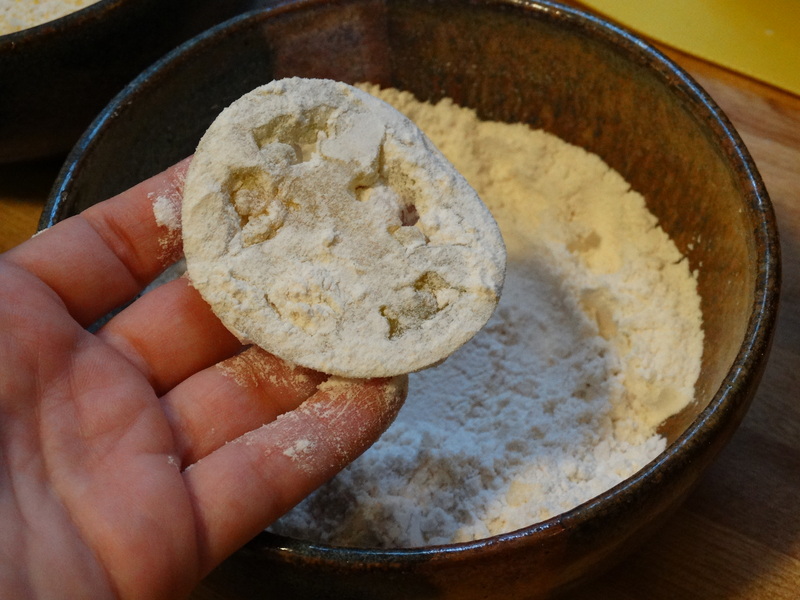 Once ready, dip one slice of tomato into the flour and coat well. Next, dip the tomato slice into the egg mixture. 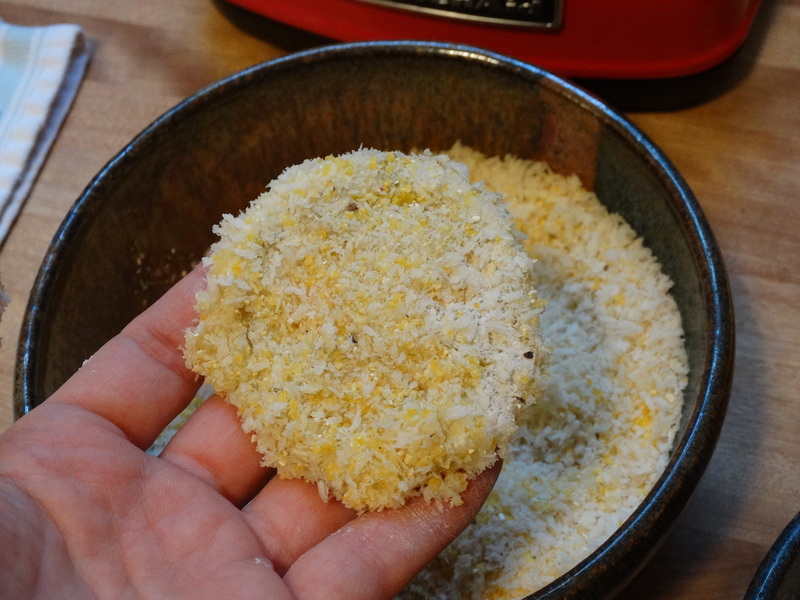 Last, dip the slice into the panko mixture until you have a nice, breaded crust. Place it into your hot pan and repeat with as many slices as you can comfortably fit. Cook for 3-4 minutes (or until browned) and then flip them over. Drizzle more olive oil into the bottom of the pan. Lift and gently shake the pan from side to side a bit to spread the oil beneath the freshly flipped tomato slices. Once both sides are browned, remove them from your pan and transfer to a serving platter. Repeat the process until you have cooked all slices. I kept mine warm in the oven for a bit and they held up just fine. We have a gas stove, so the oven is always slightly warm. 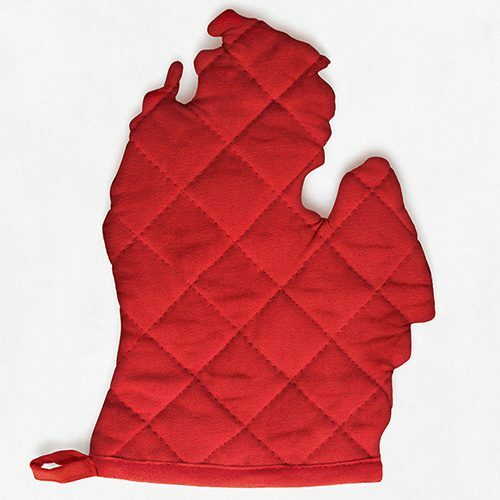 You could use the warm setting on your oven if necessary. Let cool for at least 5 minutes before serving. And don’t forget to put out the herb sauce! As skeptical as I was after my first bite of raw green tomato, these were incredible. After eating, I looked up to ask if everyone was enjoying them only to find a table full of empty plates! Seems they were a hit. 1) Bring 1 cup water, 1 cup cider vinegar, and 1/2 teaspoon kosher salt to boil in a medium saucepan. Add sliced tomatoes and cook for 2 minutes. Turn off the heat and let the tomatoes stand for 15 minutes. 2) While the tomatoes cool, combine 5 tablespoons buttermilk, 2 tablespoons basil, 3 tablespoons canola mayonnaise, 1/2 teaspoon dried thyme, 2 teaspoons cider vinegar, 1 garlic minced garlic clove, and 1/4 teaspoon freshly ground pepper in a mixing bowl and whisk until combined. 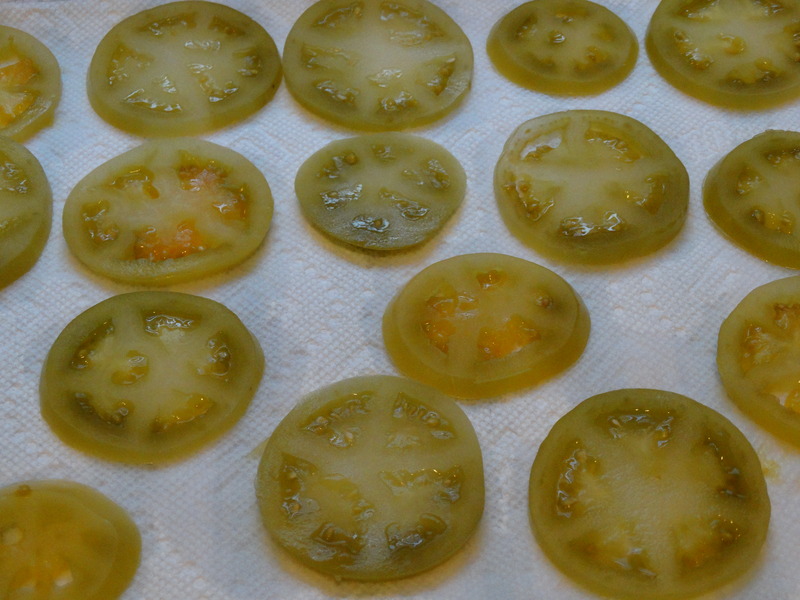 3) Drain the tomato slices and set them on a towel to dry. Heat a non-stick skillet over medium-high heat with 1 tablespoon olive oil. While the tomatoes dry, get out three bowls. 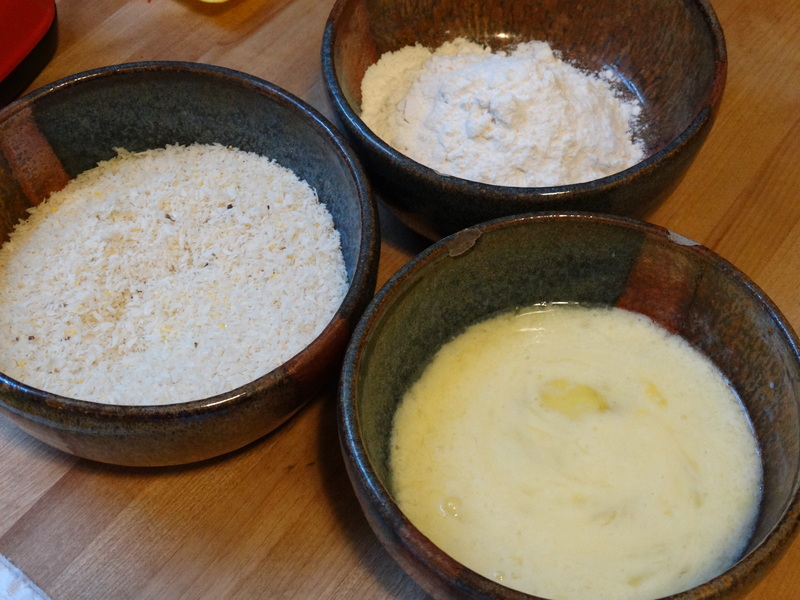 Add 3/4 cup all-purpose flour to the first bowl. 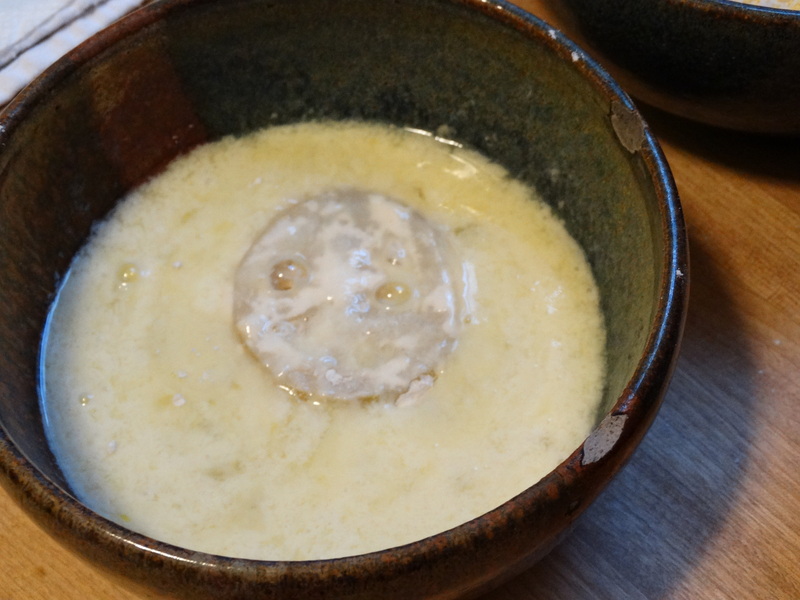 In a second bowl add 1 large egg, 1 large egg white, 2 tablespoons buttermilk, and a bit of fresh lime juice from half of a lime. Stir to combine. In the last bowl, add 1-1/2 cups panko, 1/2 cup corn grits, 1/4 teaspoon kosher salt, and 1/4 teaspoon freshly ground pepper. Stir to combine. 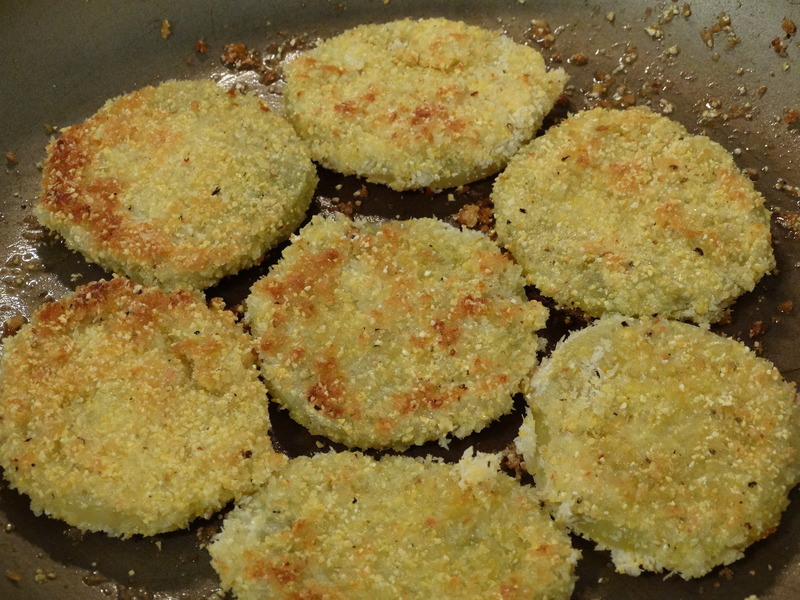 4) When your pan is hot, dredge the tomato slices in the flour, then the egg mixture, and finally the panko mixture. Cook as many slices as will fit comfortably in your skillet for 3-4 minutes or until browned. Flip each slice, add a bit more oil to the pan, shaking the pan back and forth gently to spread the oil. Cook until browned and move to a serving platter. Repeat until all slices are cooked. Let cool for 5 minutes before serving with the herb dipping sauce.